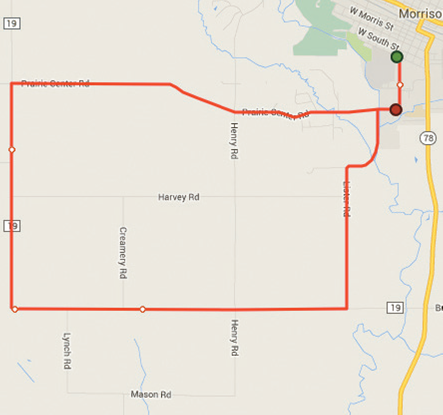 An out and back course, which starts at Morrison High School, with water stop located at the 1 mile and 2 mile. First 3/4 of a mile is flat with a small hill right before mile 1. A medium hill is located right before the turn around. The second half of the course is all down hill and fast. Course begins in front of the high school on Genesee St. and makes a right hand turn onto Prairie Center Rd., a left hand turn on to Lister Rd., then a right hand turn onto Harvey Rd. Turn around is located on the top of the hill. Bike Course: 2 lap course with rolling hills. Largest hill is located before the first mile and then again on the start of lap two. Course begins on Genesee St. in front of the high school, a right hand turn onto Prairie Center Rd., a left hand turn on to Hillside Rd., then a left hand turn onto Bunker Hill Rd, followed by a left hand turn onto Lister Rd. First lap riders will make a left hand turn back onto Prairie Center and complete a second lap. After two laps are complete then the riders will make a right hand turn off of Lister Rd. onto Prairie Center followed by a left hand turn onto Genessee St. to the finish line in front of the high school.